If you’ve been left shell-shocked while the car industry has undergone a radical shift and become more of an SUV industry, keep in mind the main culprit: the Range Rover. Land Rover’s rockstar SUV debuted in 1970 and took the world by storm not long after, but it didn’t quite start out as the luxury SUV it is today—the interior of the first Range Rover was designed to be cleaned using a hose after all. As the world’s love affair with the SUV blossomed, the Range Rover grew more luxurious and reached the point it’s at today, where it could feasibly go toe to toe with a Bentley. Curious to see if it’s true, we asked Land Rover to borrow a Range Rover LBW (short for long wheelbase) where it was to spend a week with us crisscrossing Northern California. However, as fires tragically tore through Paradise, CA, sending dark plums of smoke into the air, the skies would spend most of the week doing their best impression of the Rover’s Corris Grey paint job. It’s a shame we couldn’t spend more time outside because the Range Rover’s exterior is a shape to behold. 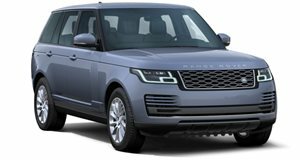 Even when muted by a darkened color scheme that includes blacked-out badging, a black grille, black accents, and black 21-inch alloys to complement the grey body, the Range Rover brings an unmistakable presence with it wherever it goes. But this is not the same SUV that first garnered the love of aristocrats. This is new money, and you can tell by the dueling nature of exterior lines sharp enough to be classified as works of Gothic architecture even if they ultimately end in dull edges. Those edges themselves double as borders for smooth body panels that add a dimension to what used to be a more squared design a few generations back. The Range Rover is pleasing on the eye, but our tester made double-takes a more frequent occurrence because of the disproportionately large rear doors that hint at the elongated wheelbase. Adding mass to a heavy SUV so it can outgun a Bentley Bentayga in the legroom department with 6.6-inches of extra space might sound like a recipe for slow acceleration times, but the supercharged 5.0-liter V8 under the hood says otherwise. 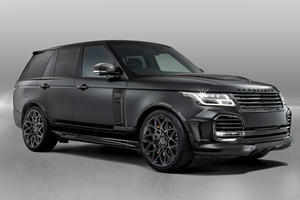 Spitting out 518 horsepower and a 461 lb-ft wallop of torque, the Range Rover Supercharged LWB accelerates to highway speeds with scary amounts of urgency. Mashing the throttle cues the 8-speed automatic to translate open floodgates of horsepower to the pavement, enabling a 0-60 mph time of 5.2 seconds and a top speed of 130 mph. Despite a combined EPA rating of 18 mpg, driving around in San Francisco’s hill-laden and stop sign-littered streets drops fuel economy to the single digits, especially since the feeling of climbing steep grades without a hint of struggle can be addicting to lead-footed drivers. Yes, you can lay partial blame for the low fuel economy on the thirsty nature of a supercharger, but the weight of a plush interior and a galaxy of toys contributes too. Step into the driver’s seat and shut the door and immediately the senses are greeted by comforting silence and the scent of leather. 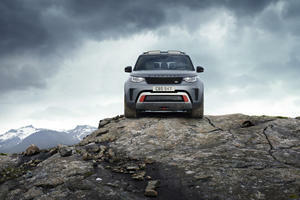 The layout is simple but elegant, retaining Land Rover’s ethos of combining luxury and no-nonsense utility. Missing from the center console is a traditional shifter, replaced by a round twist-to-shift knob that sits flush with the console and rises when the Rover is started. It’s one of the few shifters of it’s kind we didn’t mind using, so no complaints were raised when a similar design was used for the drive mode selector knob. With the exception of a few buttons, the interior’s fit and finish feel upscale, especially with black leather and black veneer trim allowing the aluminum accents to shine. Looking up reveals a soft headliner and large sliding panoramic roof, which somehow adds size to the spacious cabin. Headspace is aplenty thanks to the Range Rover’s 72.4-inches of height, but that figure is unreliable due to the suspension system. It doesn’t only vary how soft or harsh the dampers ride, it also raises the SUV during rock crawling adventures or lowers it at low speeds and in Park to make navigating low clearance parking garages or getting in our out of the cabin easier. It feels nice having the Range Rover “bow” to us after being fetched by the valets, but more special is the back seat. From it, it’s easy to see how 7.3-inches of the 7.8-inch longitudinal growth spurt goes towards rear occupant legroom rather than storage, which comes in at a still-large 31.8 cubic feet (without the executive seating package) and 75.6 cubic feet with the rear seats folded. For all the experience and star power Land Rover has amassed by building capable and luxurious off-roaders, the Range Rover lives up to its creed by instilling drivers with confidence on bad terrain (along with added fear for the sleek sheetmetal and optional blacked-out 22-inch wheels that go for $2,855) and by driving like an S-Class—land yacht coasting sensation included—on the open road. With the drive mode selector retracted into the center console, cuing Automatic mode, the Range Rover rides softly in Comfort unless it senses urgency and adopts more dynamic characteristics or detects bad conditions and activates off-road settings on the Terrain Response all-wheel-drive system. There is the body roll you’d expect from an SUV that feels every bit of its 5,404-pound mass in the corners, but absent during a turn is the sensation that the chassis is a fragmented collection of metal beams. No matter what you throw at it the Range Rover rides as one solid piece, evidence that the chassis engineers put in their overtime hours. Robustness of the frame along with a driver’s seat situated so that visibility is hardly an issue makes the Range Rover easy to maneuver and fools a driver into thinking they are piloting something smaller. Even though the engine can hustle this behemoth like a sports car, the luxuriously light yet slightly rubbery steering makes quick maneuvers uncomfortable even if they’re technically possible. In Comfort mode, soft suspension means that bounding over uneven freeways at 60 mph sends the body bouncing around like a waterbed in an earthquake. All of that can be solved by switching into Dynamic mode, at which point the suspension stiffens and a driver once again becomes the captain and not just a disaster mitigator. After spending some time getting to know how to work the electronics, the Range Rover’s weak point reveals itself in the Touch Pro Duo touchscreen inference system. In theory it’s a decent idea; the bottom screen controls HVAC and the top takes care of semi-essentials like the radio and navigation. The system makes the interior feel technologically advanced without casting aside the old school luxury vibe and it would have been a success if the touchscreens were more responsive and if their layouts weren’t so cluttered with menus that changing radio stations or using the navigation system feels like an annoying chore. More tech-savvy buyers will still complain, this time about how laggy the system can be, since it takes a few seconds to register a command in certain menus and because there is no Apple CarPlay and Android Auto to smoothen the process. But that’s not the worst of it. Our Range Rover’s Touch Pro Duo system was also plagued by a faulty lower screen that randomly decided to display a grey background and nothing else while driving on four separate occasions during the week. Each time, we lost access to the HVAC controls and on multiple occasions, got many lungfuls of California fire smoke when the air conditioning system would go through its periodic shutoff of the recirculation system (even when the system was working and air purity modes were set to high, there was no discernible way to turn air recirculation on permanently) and the button to reactivate it had disappeared into the matrix. Turning off the Range Rover and leaving it alone for 20 minutes usually got the lower screen working again, but this is an unacceptable issue for a modern vehicle, especially one with a $126,380 sticker price. Make no mistake, aside from the buggy tech, the Range Rover is worth every penny and could even be considered a bargain within circles where each member has a vacation home or two. It’s every bit as luxurious as a flagship Mercedes or Audi and comes with an equal rank in the status symbol hierarchy even though it’s more capable by a few orders of magnitude. If you can live without fancy 22-inch wheels, the $2,400 Vision package that adds auto high beams, a HUD, and interior lighting, the $2,140 Black Exterior package, the $2,040 Drive Pro Pack that includes a locking rear differential and towing equipment, and a number of other toys, a Long Wheelbase Rover can be had for $109,890 including destination. Long Wheelbase buyers can only get the supercharged 5.0-liter V8 unlike shorter models that can house a V6 diesel, a four-cylinder plug-in hybrid, or two supercharged V6s under the hood in addition to the 5.0-liter. Trims and horsepower levels for the LWB only go up from the Supercharged model with the Range Rover Autobiography coming in at $149,290 and the Range Rover SV Autobiography totaling $208,895—both of which see the 5.0-liter’s output hit 557 horsepower. It sounds kind of ironic to say it in today’s SUV-happy climate, but the Range Rover may be among the few true luxury SUVs. The others are crossovers. Bentley’s Bentayga and Rolls Royce’s Cullinan ride tall and look the part, but they’re just crossover status symbols for people who will never brush against the edge of their capabilities. Not so for the Range Rover. 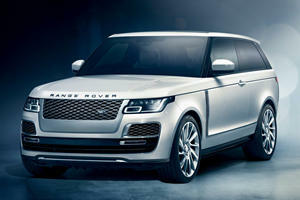 Even though it’s gotten prettier and more approachable as an accessory for a Los Angeles luxury shopping mall parking lot than a terrain conquerer, the Range Rover, along with the Mercedes G-Class, are two of the last true luxury SUVs that have yet to go soft, and only one of them is offered in long-wheelbase format. If you can afford it, you might want to get it while you still can.